Greece and the Greek islands are famous the world over for being one of the top destinations where you can enjoy some of the most memorable and magical cruises, visiting a wide selection of islands as you sail around the Ionian and Aegean seas. Cruising around the Greek islands is the perfect way in which to appreciate and understand what makes Greece such a wonderful place to visit. Many visitors to Greece will find themselves looking to book a cruise, whether it be a simply daily cruise around some of the most famous islands in Greece, or a longer one, where one can visit a selection of different islands. The Aegean sea is home to many of the most popular Greek islands. You will find the islands of the Cyclades such as Santorini, Mykonos, Naxos and Paros in the central part of the Aegean. To the east are the Dodecanese islands of Rhodes, Karpathos and Kos, while above those are the North East Aegean islands including locations such as Samos, Lesvos and Chios. On the west of the Aegean are the Sporades islands including Skiathos and Skopelos. The crystal blue waters of the Aegean and Ionian seas create a wonderful setting that is ideal for cruising. There are so many beautiful islands found scattered all across the waters, such as those of the Cyclades, Dodecanese, North East Aegean in the Aegean sea and the charming Ionian islands in the Ionian sea. Depening on the type of cruise holiday you are looking for, there are a number of choices that you can have. Probably the best one however would be a cruise that will depart and then return back to the port of Piraeus in Athens. This will make it a lot more convenient for you to actually travel to Greece in the first place by air, and once you arrive in Athens airport, getting to Piraeus is a pretty simply journey. If you don't have too much time during your stay in Athens then you can enjoy a one-day cruise that takes in the beautiful islands of Aegina, Poros and Hydra in the Saronic Gulf. As you cruise around these islands, you will have a couple hours on each to walk around, enjoy a meal or have a refreshing swim. For longer cruises, there are some that can last between 7-14 days depending on which you choose. The most popular cruises are around the Cyclades, spefically taking a stop at some of the more popular ones including Santorini and Mykonos. If you are visiting Santorini during the summer months, then you will no doubt see numerous cruise ships sailing into the caldera on a daily basis. Other popular cruises in the Aegean will also take in some of the islands of the Dodecanese such as Rhodes, Patmos and Karpathos, as well as a couple stops along the coast of Turkey. For the younger traveller, there are a number of daily cruises ( booze cruises as they are often referred to ) around popular resorts and islands where you can enjoy partying on the boat at locations such as Zakynthos in the Ionian and Malia on the island of Crete. 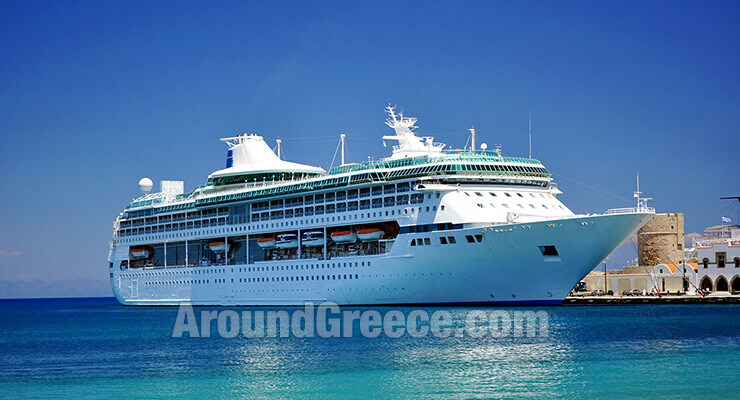 There are a number of international cruise companies who offer cruises in Greece and around the Greek islands, as well as lots of smaller local cruise operators that provides daily cruises around their more localised areas. Whether you are looking for a 2 week cruising experience of the best islands in Greece, or are simply on the lookout for a day cruise to take in some of the beautiful islands, you will be able to find exactly what you are looking for. Below you will some of suggestions to enjoy a cruising experience when you are in Greece. If you are looking for a unique sailing experience in Santorini then check out the daily tours that Santorini Speed Sailing have available. You can enjoy cruising around the island on their unique trimaran boat, as well as take in some of the other nearby islands in the Cyclades. Based in the region of Larissa on the east coast of Greece, Stavento Sailing offer a great selection of cruises and tours to the beautiful islands of the Sporades which include Skiathos, Skopelos and Alonissos. They also have sailing boats available for charter.